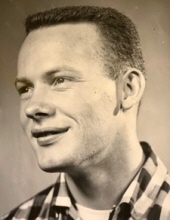 Paul Smyly, age 83, passed away on the morning of January 14, 2019, in Coeur d’Alene, Idaho. He was a loving husband, father, and grandfather. Paul was born in Martinez, CA, on March 4th, 1935. He married the love of his life, Sharon Howard, on August 10th, 1957, and was lucky enough to spend 61 wonderful years and countless adventures with his best friend. Paul’s career as a successful businessman began in California, and lead him to settle in Spokane where he served as President and CEO of Itron, Inc. At retirement, Paul and Sharon designed and built their dream home on the banks of beautiful Spirit Lake, Idaho. Inspired by the beauty of the Northwest wilderness, Paul pursued his passion of woodworking and started Mission Spirit, a craftsman-style lighting company. He designed and built custom lighting that was distributed across the country. Paul’s legacy will live on in the hearts of all who knew him. His radiant smile and welcoming spirit touched everyone he encountered. Paul is survived by his loving wife, Sharon; two sons, Michael (Lorrie) of Spokane, WA, and Patrick (Paula) of Post Falls, ID. He was the beloved ‘Papa’ of four grandchildren, Taylor Reed (Blake), Shelby, Janna Williamson (Mark), and Mark (Sydney), and two great-grandchildren. To send flowers or a remembrance gift to the family of Paul Smyly, please visit our Tribute Store. "Email Address" would like to share the life celebration of Paul Smyly. Click on the "link" to go to share a favorite memory or leave a condolence message for the family.